Most of all, you want to look great...so we're here to help! And nothing looks as great as a real brass or nickel-silver name tag with rich black lettering and a crisp logo. Engraved custom metal name badges are the final touch for professional career apparel. Okay, let's see how you can provide your staff with badges they'll be proud to wear. When you're done reading, call us for a free sample. We answer in person by the fourth ring. Click this image for a closer look, to understand why our custom metal name tags are so eye-catching - and legible too! The trick is our two-tone MetalFrost process. First, the edges are buffed to create a bright polish, framing the lettering. Second, we etch the remainder of the metal to create a matte, frosted region that dramatically highlights the rich black letters and logos. The polished edges really stand out against professional career apparel, while the dark letters on the matte metal background ensure your name is easily read. Just add a logo for the perfect individual and company introduction for your metal name tags. 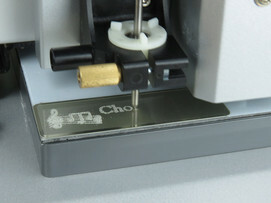 Here we've placed a nickel-silver blank name tag on the corner of our AutoGraver engraving machine bed for easy production of silver name tags. Simply align the tag with the edges of the bed's tacky surface, press, and the tag remains firmly in place. Check out our budget guidelines too - at the bottom of this page! With a library of fonts and numerous logos, you're likely to find just what you want in our professional software. Need custom logos? E-mail a file and we'll convert it to an engraving format...usually overnight. High volumes of names and titles? Import a spreadsheet. This engraving machine leads the way in versatility, and it hums along, using a safe, spinning "burnishing" tool to remove a thin layer from the top of the metal name tag. Just wipe your engraved tag with a dauber moistened with a special solution, and the engraved letters turn black instantly. 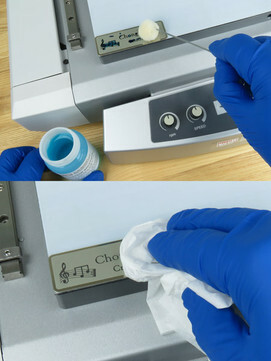 Then blot the surface dry with a tissue. 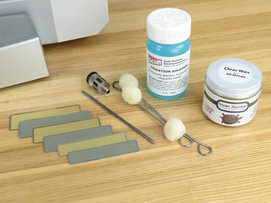 Lift the tag off the engraver and apply a magnetic fastener or a safety pin to the back surface. Finally, wipe the surface of the metal name tag with a touch of wax on a soft cloth, to create even richer, blacker letters that really pop! Hardware, softrware, materials and...friendly advice! Here you go...blank metal tags, long-lasting tools, blackening solution, wax, even a handy dauber to make your tag letter-perfect. Brass name badges, silver, gold...you name it. We've proved our metal, over and over! And remember that one of our most important items is free...friendly phone advice from knowledgeable staff. Pricing guidelines and other tips appear below. Should I make my own tags, or buy them ready-to-wear? If you require name tags instantly for your employees - airline pilots, museum docents, hotel bellmen, security guards - then you'll want your own badge-making system. If you can wait a couple of days for us to make your tags and send them to you via Priority Mail, then buying finished tags can be a good choice. Are the name badges made from real metal? Yes, we use solid brass and solid nickel-silver materials. The invisible clear coating prohibits tarnishing or dulling after many years of handling. At a glance, everyone knows these are miles ahead of low-quality, gummy-tape-on-aluminum tags. What size tags? Prices? Attachments? 5/8" x 2 11/16"; 7/8" x 2 3/4"; 1" x 3"
High-strength magnetic fasteners are $2.16 each; safety pins are $0.27. Both come with a permanent peel-&-stick adhesive. 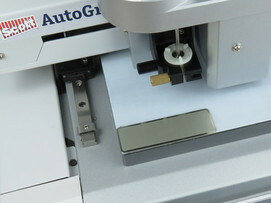 What's the price for a complete Scott AutoGraver engraving system? An engraving machine and professional software package costs $4,514. Where can I see the complete line of Scott Signgraving machines? Last but not least, one of our most important items is free...friendly advice by phone. Sure, engraving machines are sold online, packed in a brown box. But if you prefer equipment wrapped in friendly support that you can contact weekdays, 8:30am-5:00pm, then we're the right supplier for you. We make most of everything we sell, and we can help you engage your staff and guests with name tags and signs engraved for a lasting impression.